Many of us are familiar with the devastation that recent wildfires in California have caused, most notably in the town of Paradise. Hundreds of families have lost everything and are beginning the process to rebuild their homes, schools, and entire community. Paradise Unified School District is facing uncertainty as many high school seniors are trying to figure out how to continue their path to graduation when many have lost everything. When Bob Wilson, an 89-year-old real estate developer in San Diego, heard of the devastation in Paradise, he knew he had to help. "It hit me that maybe I could do something and I really wanted to do it now, I wanted to do it directly and I got ahold of the principal and I talked to him about it and you could've scraped him off cloud nine, quite frankly," Wilson said. 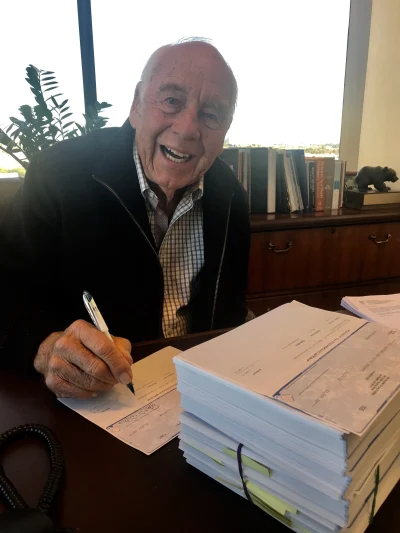 Two weeks after he made up his mind, Wilson began distributing $1,000 checks to 982 students and 105 teachers and school staff who were affected by the Paradise Fire, with a heartfelt and personal letter to go along with each generous donation. Wilson, who said he was "over the moon" about the event, explained that he was compelled to meet and help give the teens some autonomy in any way that he could. "I had such a great time in high school. I just wanted, if I could do anything to put a smile on their face, give a little freedom to do whatever they want to do, take their minds off what happened for a short period of time, I would be more than compensated I'll tell you.” Wilson remarked. Read the full story from ABC news. Wilson’s act of pure kindness and selflessness is a heartwarming example of the generosity of people in a time of need. While a fire like the one in Paradise can cause much devastation and stress among those affected, there are great reminders that there is good that can come from tragedy. Interested in helping those affected by the wildfires in Paradise and other parts of California? Check out the California Community Foundation.